Picture a perfect beach. 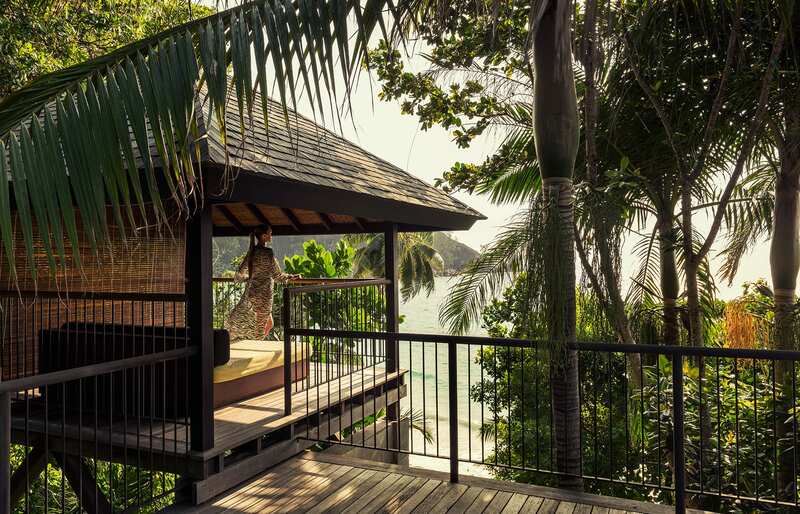 Add beautiful villas perched in the tropical canopies… and a top-notch service. These are the ingredients of the ultimate resort experience. 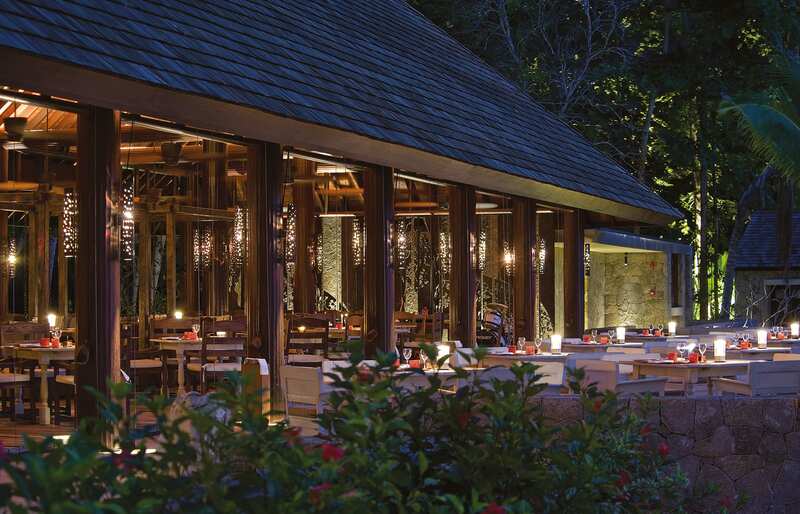 It is also exactly what the Four Seasons Resort Seychelles has on the menu. We couldn’t wait for the opportunity to check it out. 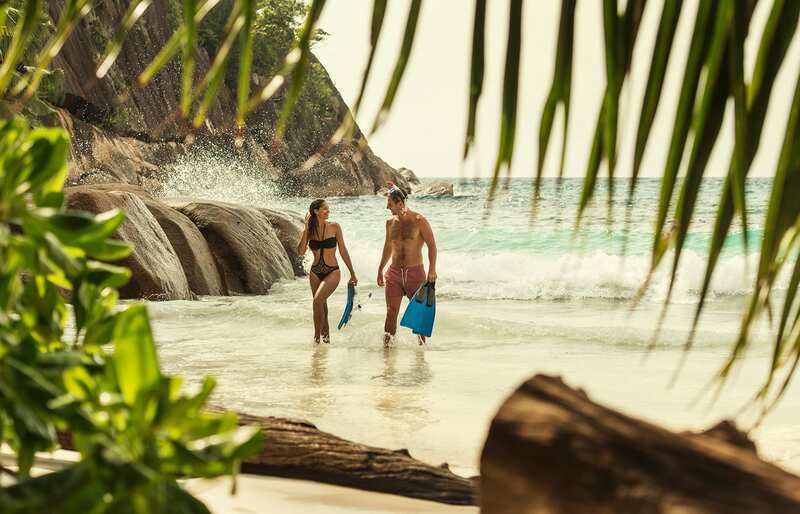 After years of telling ourselves that we ought to visit Seychelles again, we finally got our act together and organised the trip. 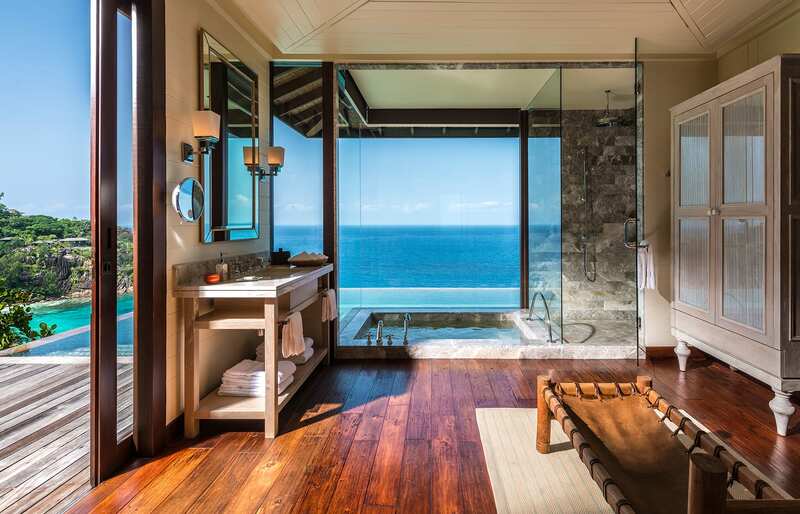 The question of including Four Seasons in our itinerary practically answered itself — we kept bumping into the mentions of the resort, typically referenced among the best in the country, year upon year. 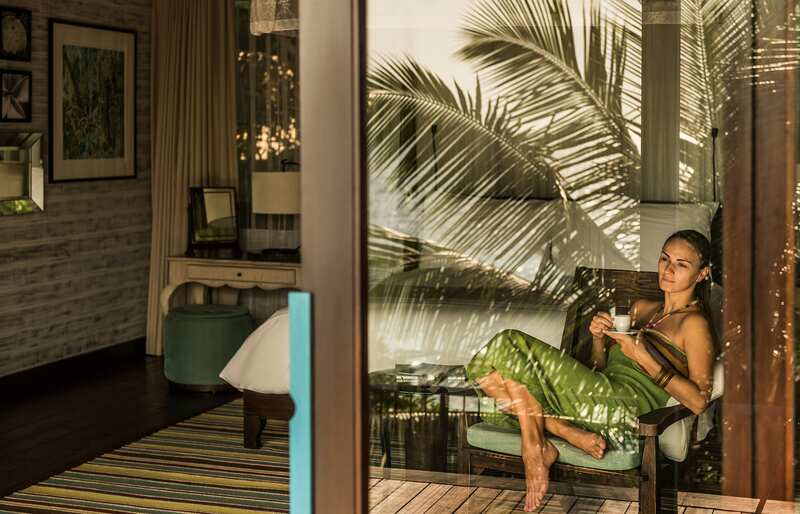 The Four Seasons Hotels and Resorts offers its own formula of relaxed luxury, enabled by the refined elegance and the highest standard of service. 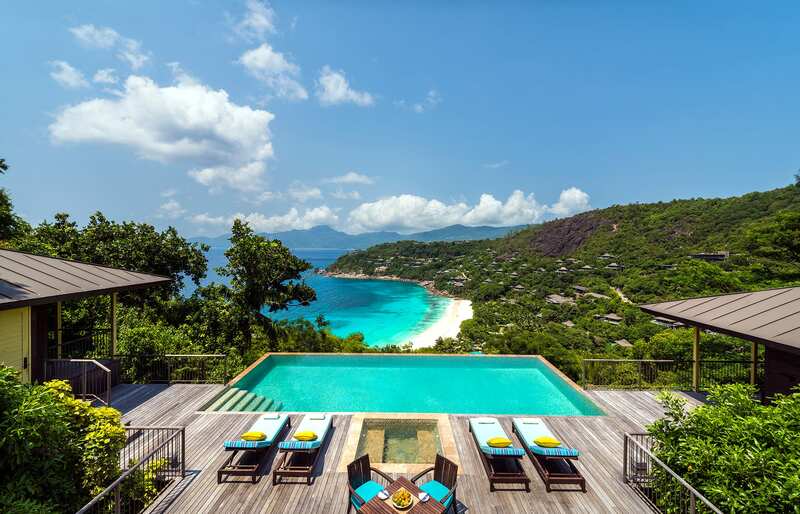 The Seychelles property follows the chain’s templates — and it has all you’d expect to find at a contemporary beach resort. First of all, the hotel wows with its address. 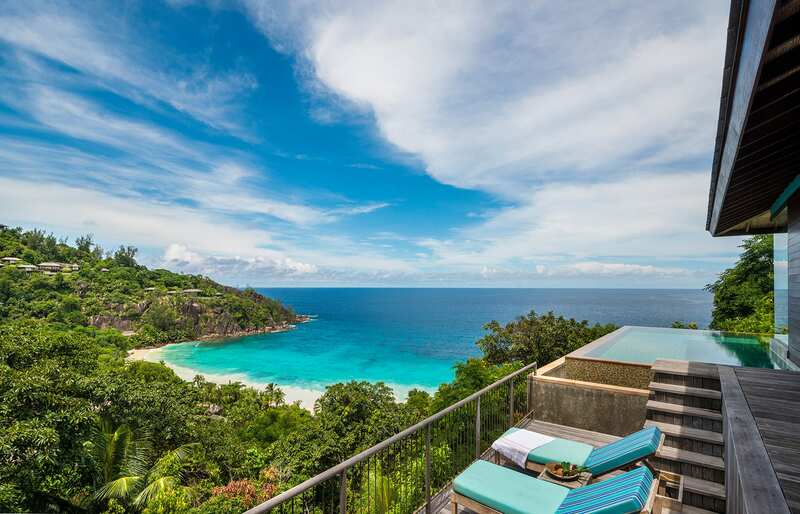 It occupies an exclusive spot by Petite Anse, one of the Mahe island’s most picturesque and attractive beaches. 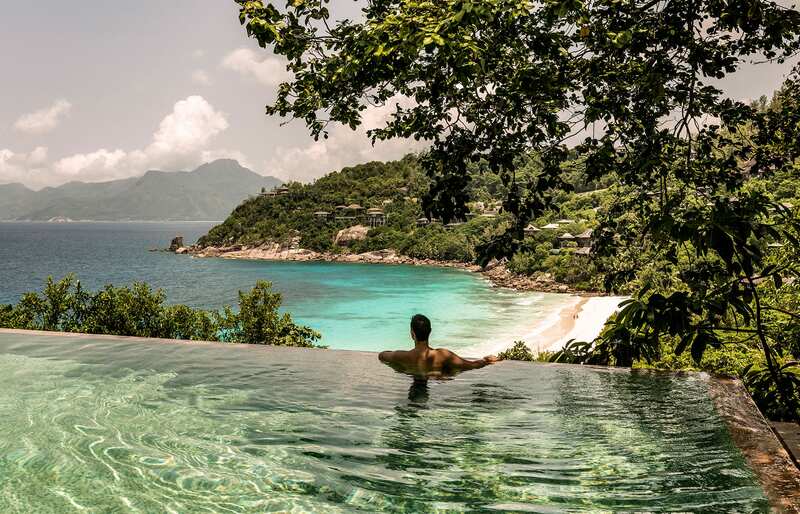 Perched on the surrounding hills and tucked amongst thick tropical greenery, the Four Seasons Resort Seychelles scores major points just for its natural setting. 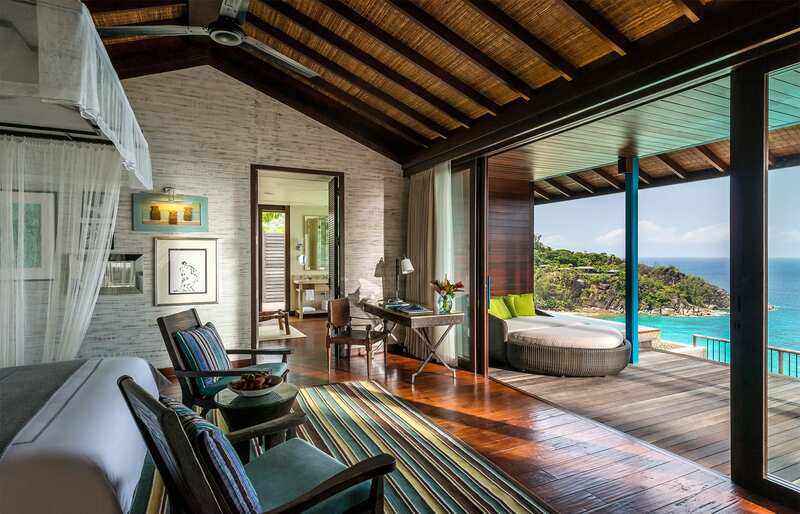 Dotting the slopes are the exceptional guest villas. They are scattered among the lush forest and make the best out of the location. 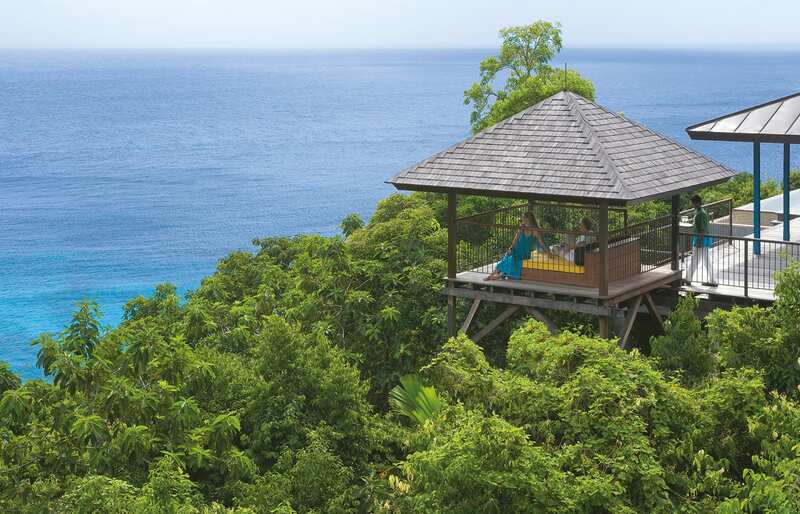 Facing the sea, many offer truly fantastic views of the ocean and the tropical canopy. As we arrived at the resort, to the all-encompassing warmth of the welcome, we looked around the lobby and appreciated its interior. 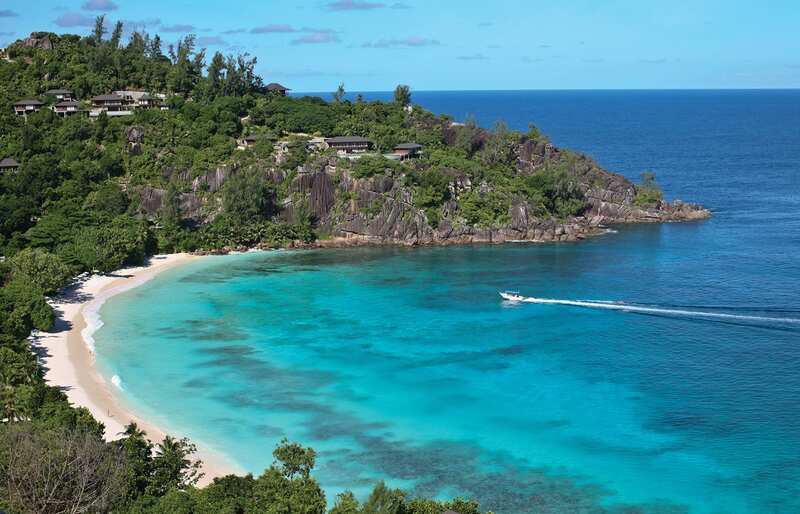 There is a certain restraint in the Four Seasons Resort Seychelles style we really like. It’s elegant and sophisticated and gives just enough nods to the French, Creole and African influences to make it feels well rooted in the local traditions. Soon we were being driven to our Hilltop Ocean-View Villa, via the incredibly steep, winding roads of the resort grounds. The first impressions were, of course, related to the views — they are truly ohs-and-ahs-inducing. And just like all the guest villas, ours benefited from a great amount of roaming space. 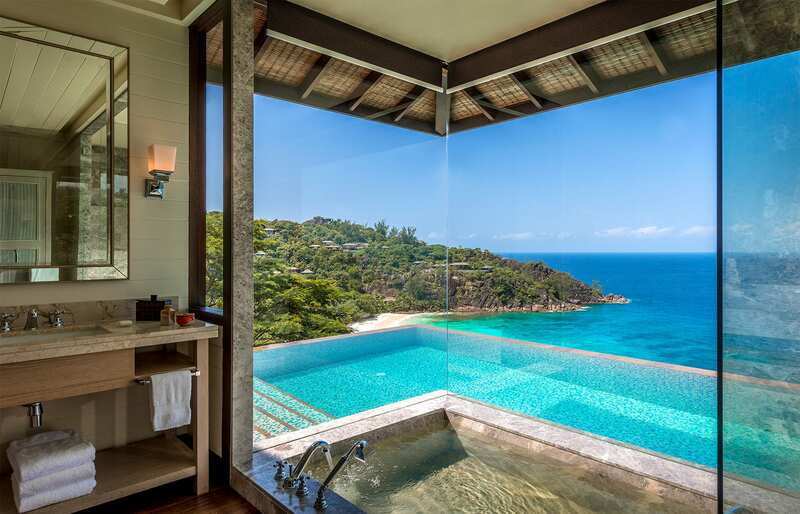 Blending the in- and outdoor living, the decking links the bedroom with the al fresco shower area and the infinity plunge pool, which has a pretty good, swimmable size. The interiors are quietly tasteful. 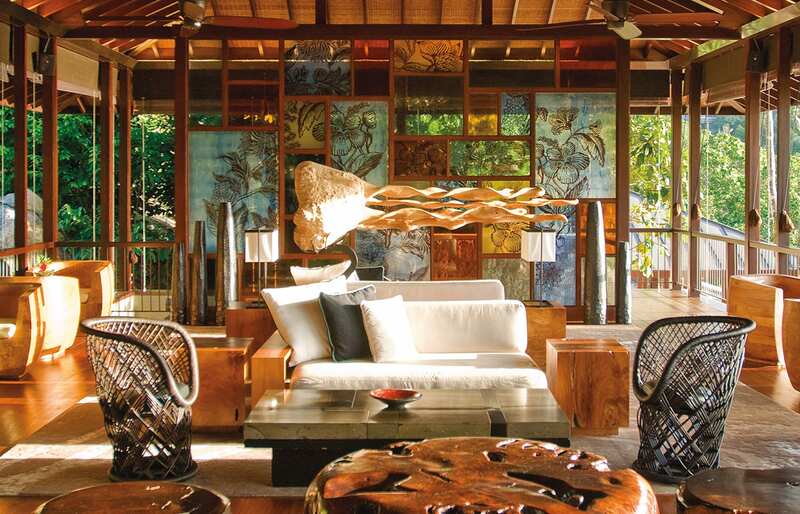 The whitewashed timber and custom furniture share space with pieces of the traditional craft. 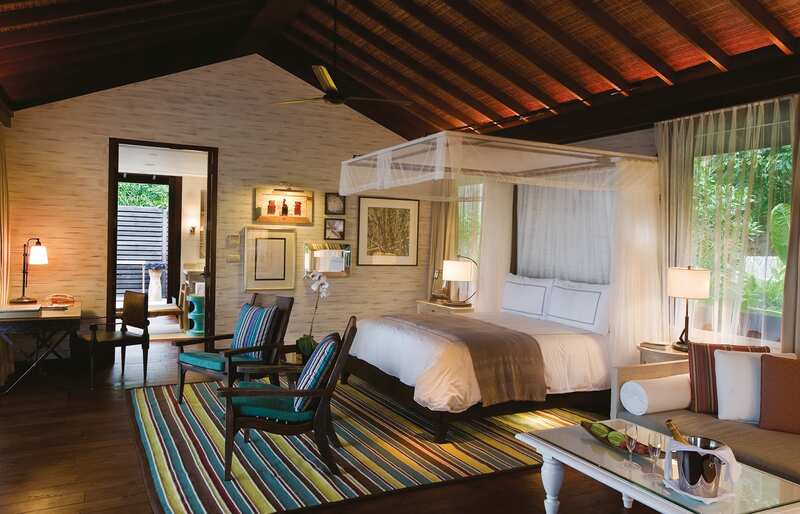 Splashes of colour, inspired by the Seychellois palette, liven up the sophisticated theme. We settled in just in time to witness a truly amazing sunset, which we enjoyed with a glass of champagne, perched on the outdoor terrace. The beach demands a separate mention. 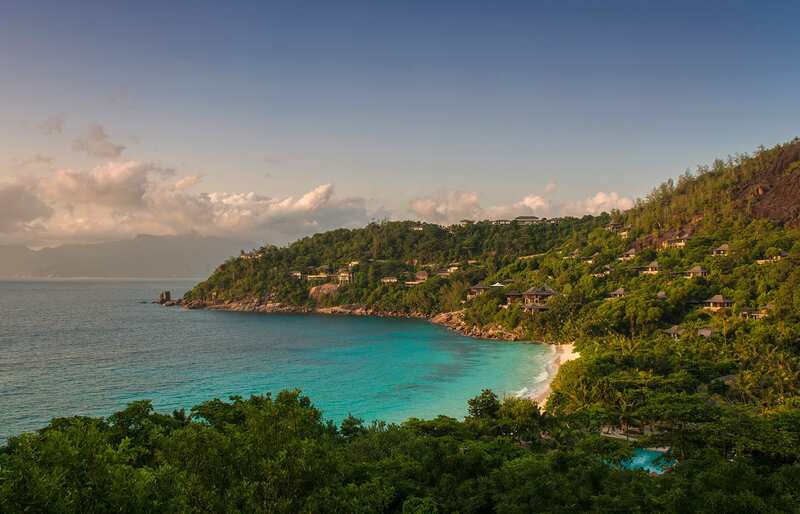 It’s one of the best we’ve been to in the Seychelles — and that’s saying something. Wide, long, pure, and flanked on both sides by granite rock formations (actually, on one side it’s a whole mountain of rock), the Petite Anse is simply picture-perfect. 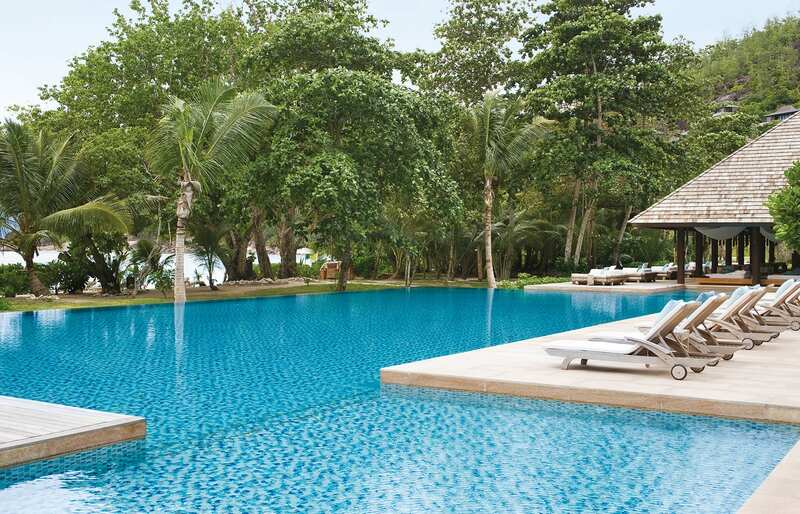 Adjacent to the beach are the main facilities, with the large swimming pool and the Kannel restaurant and bar. Breakfasts are served a little bit up the hill, in the Zez restaurant. At the very top of the resort is the spa. 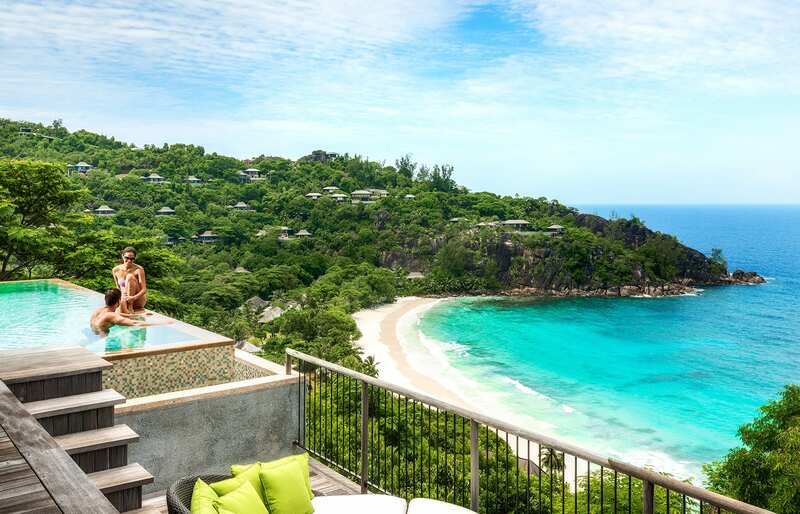 Thanks to the best vantage point, it offers some truly stupendous views over the island. Of course, the main reason why we went up to check it out was to look at the menu and book an appointment. We picked the signature Coco de Mer “ritual”, and it was a fine choice indeed. From ambience and scents to the level of pressure and the skill of the therapists, the session was a wonderful experience. The spa had an atmosphere of a pure tropical escapism and in a way, it symbolised to us the experience of the entire resort. 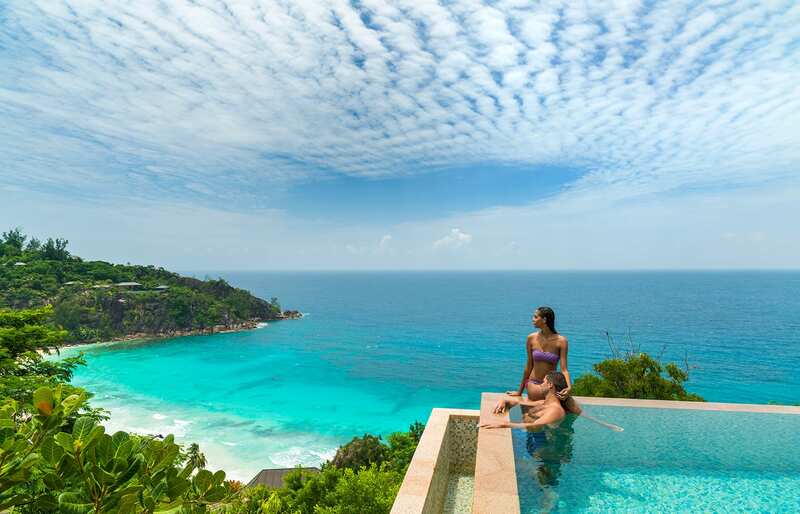 The Four Seasons Resort Seychelles is a blissful retreat from the everyday reality… if only for the precious few days. 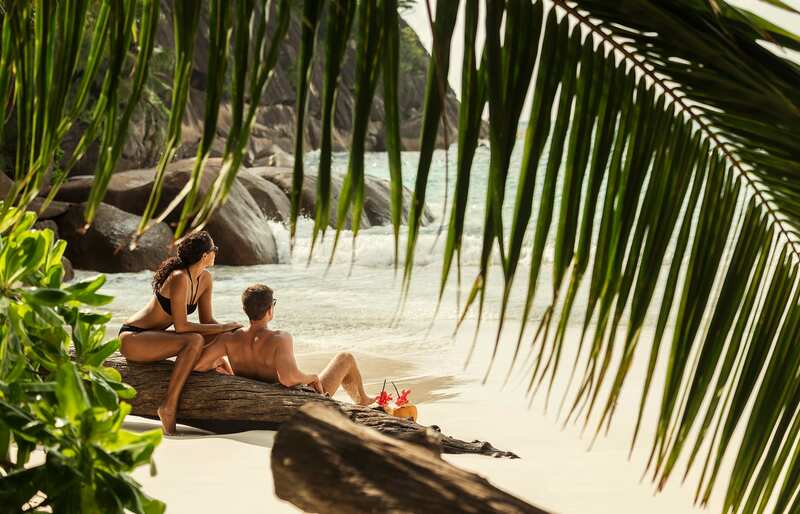 Perfectly appointed, beautifully designed, and distinguished by great vacation atmosphere, the Four Seasons Resort Seychelles defines the standard for the tropical beach resort luxury. It's a great choice for a relaxing stay, as much for couples as for families. Natural setting and the resort landscape. This property is set among a verdant tropical greenery and build on steep hills that roll down to the beach — and the beach is just perfect. Made of white, powdery sand, lapped by the calm, turquoise sea, and capped by a massive natural rock wall at one end. It's stunning. 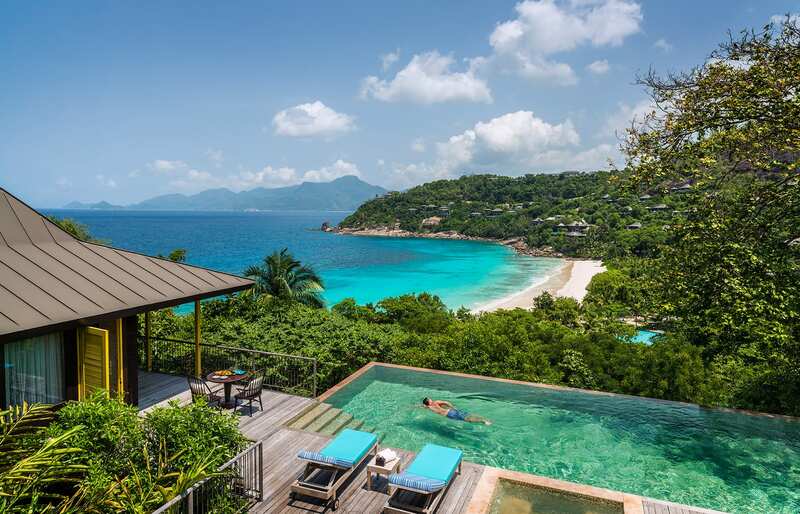 Great villas. They are built on stilts and positioned to take advantage of the fantastic views. They are very comfortable and spacious — the bedroom and living area space naturally flow to the surrounding outdoor decking, which sports a lovely plunge pool. 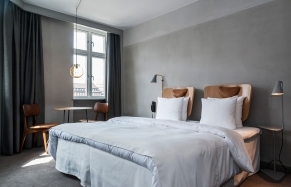 We like how the Four Seasons design keeps a nice balance: not too conservative, nor trying to wow with novelties. 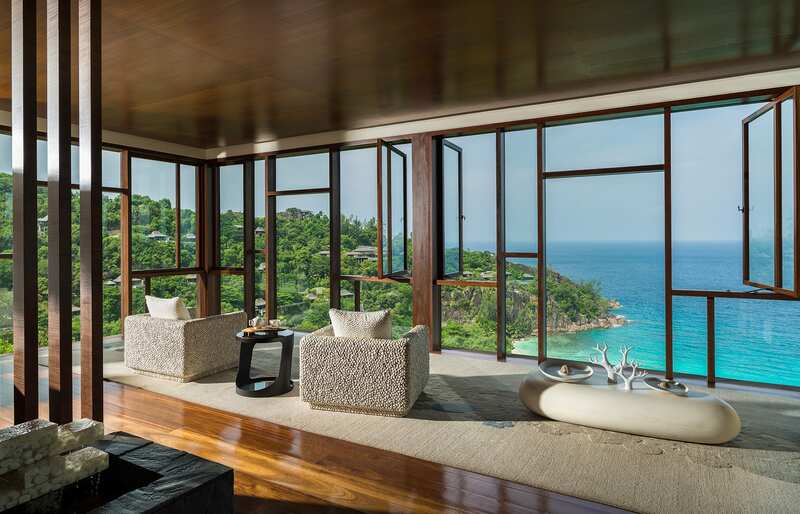 The interiors set warm tones and dark teak floors against granite walls and polished marble. The result is sophisticated and yet relaxed. At the Spa, the treatments are superb and the ambience is lovely. 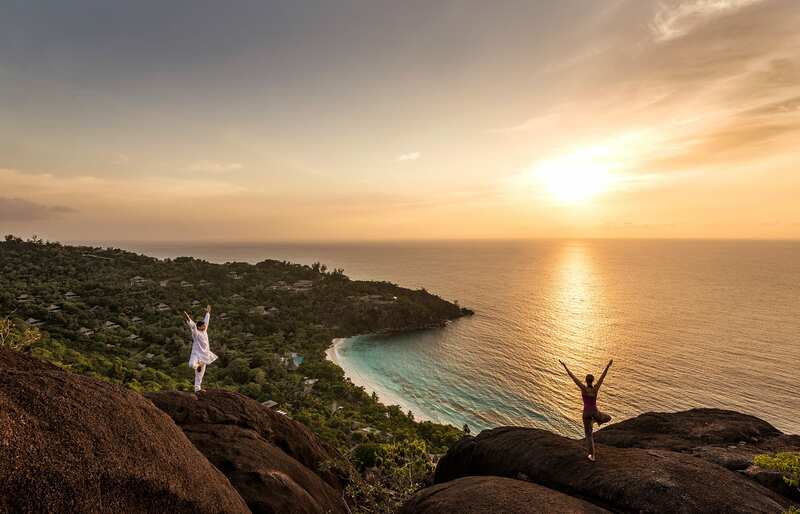 Moreover, the spa is located at the highest spot and guarantees some truly stunning views, especially at the sunset hour. Go to the spa rooftop viewing platform for the best experience. 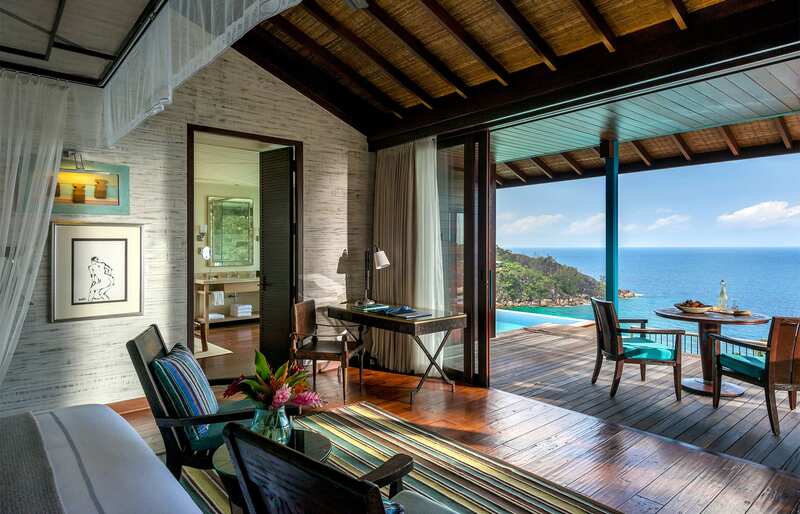 The Four Seasons Resort Seychelles feels both intimate and grand. Its size makes it feel never crowded, even when it is fully booked. 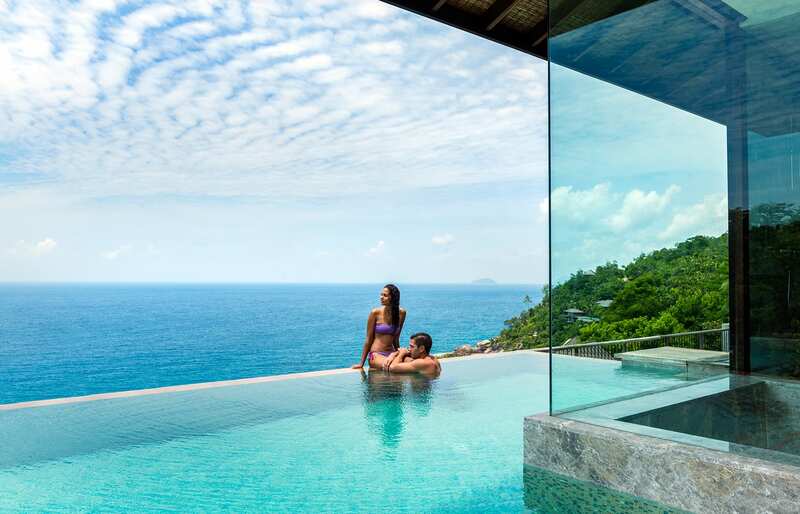 This dreamy resort is as luxurious as they get. 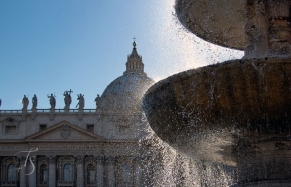 It offers its guests a fantastic hotel experience, further enhanced by the super high standards of service. The staff is professional, friendly, efficient and discrete. 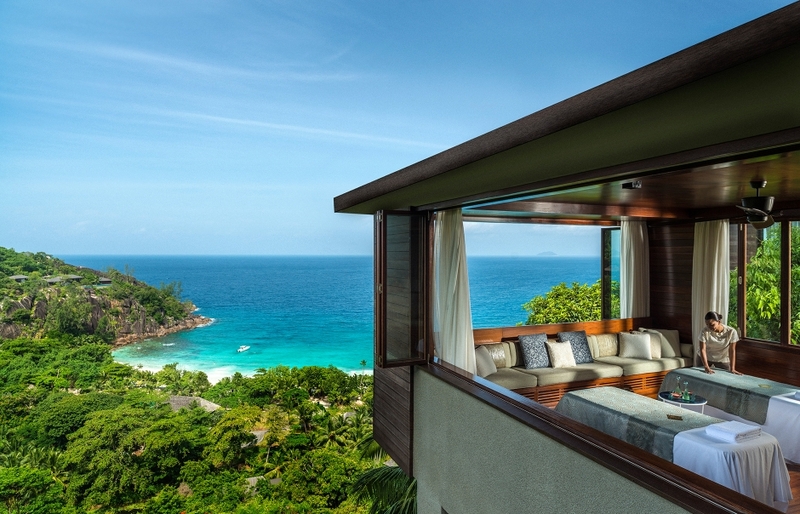 All villas share a similar design and layout, but not necessarily the same view. 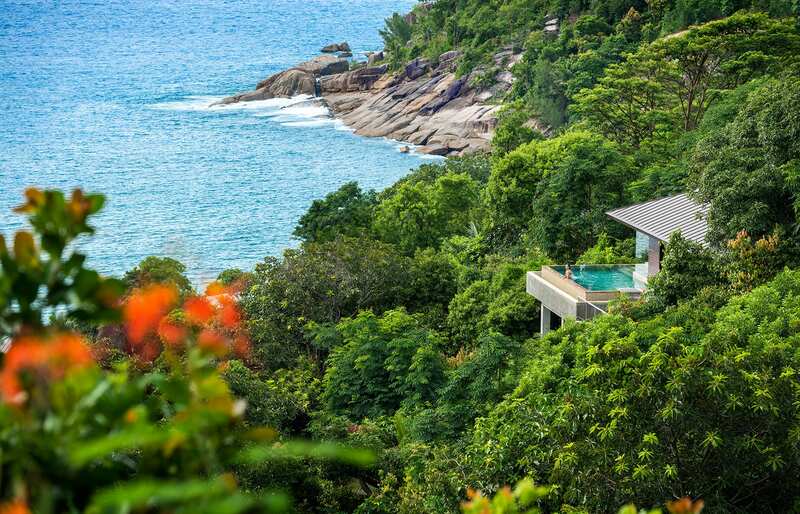 The garden view villas are shaded by overgrown jungle, but they are more private. 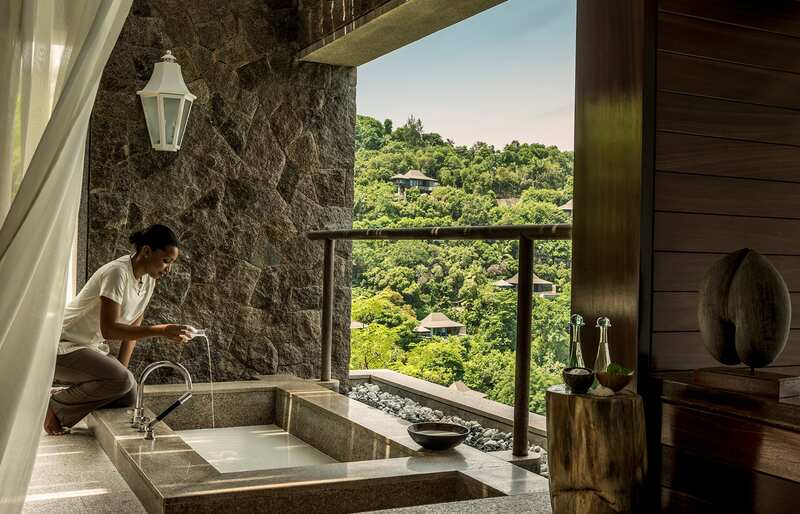 The more expensive hillside villas offer wonderful views but the level of privacy varies. Still, we think it's worth spending extra to book one of those with the better location. The hotel is to a certain degree family-oriented, so honeymooners may want to keep that in mind. But as we said, the resort never felt crowded. Due to the resort's topography, a buggy ride will be necessary for most guests, e.g. when getting to the beach, and especially to the spa. There is no inconvenience though—we never waited more than 5 minutes. By the way, some villas are also wheelchair-equipped. 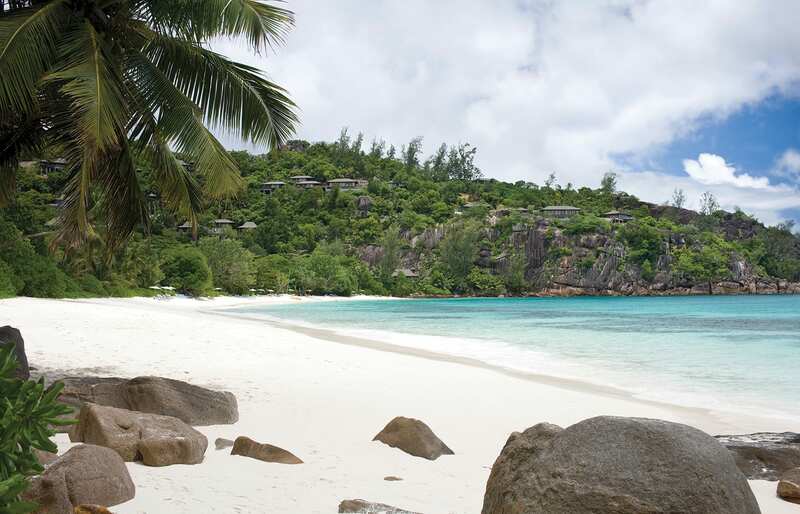 As all beaches in the Seychelles, the Petit Anse is open also to the outside guests. However, the access is really only possible from the sea. The locals do sometimes arrive on motorboats or other motorised sports vessels (this may result in some extra noise). It takes some 40 minutes by car to travel from the airport to the hotel.